Polysciences Bead Coupling Buffer, pH 6.0 | Polysciences, Inc.
Polysciences Bead Coupling Buffers are ready-to-use buffers that are available in a variety of pH levels (4.5 to 9.0). They can be used as coupling or wash buffers for plain, dyed, or functionalized polymer microspheres. 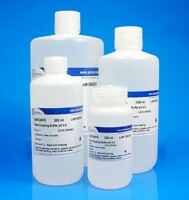 Try our Bead Storage Buffer available in two pH levels: 7.4 and 8.5.